Marvel’s Cloak & Dagger explores the idea of regression after suffering a major setback in life as Tandy and Tyrone both deal with unplanned obstacles in the way of them gaining closure on their personal tragedies. To an extent Evita is the lens used to explore this idea. The episode returns to a classroom lesson about regression and how it impacts stories about heroes. At this point it is a bit of a stretch to call Tandy and Tyrone heroes but their arc do resemble the traditional heroes journey in the sense that they are overcoming hardships to become better people. Some really interesting points about regression are made throughout such as it being an illusion since it’s possible for someone to return to what they once were. Life is about growth and change so even though it’s possible to repeat behaviour patterns that doesn’t mean the person doing that has reverted to who they were when they used to act like that. Tandy falls back on old habits after last week‘s revelation that her father used to beat her mother. Her default coping mechanism is to run away from the problem so she returns to the life she was leading in the first episode where she would seduce gullible men in order to steal from them. She does this with a twist that involves her stealing something that is undoubtedly far more valuable. Her powers have evolved so much that she can absorb the hopes of others rather than simply seeing them. Her current mindset is a fairly hopeless one so taking the hopes of others is the only way she can experience that. It’s a really harsh thing to do and plays out in really interesting ways. The most striking image was Mina’s fantasy of natural beauty changing to dark decay which affects her so profoundly that she kills a bee; the very thing she was obsessed with saving so recently. Things like this are a testament to the strong work done on the characters on this show. In a very short time Mina was characterised as a devoted environmentalist with an enthusiastic motivation to make the world a better place and preserve what exists before it becomes lost forever. Tandy taking it from her has a very real tragic effect as she appears to be in a daze after this as if part of her has been lost. It’s unclear whether this will be permanent or if Tandy will be able to restore that once she comes to her senses but for now it’s a very concerning direction for her to go in and the impact it has on others is significant. Adding further sting to Tandy’s treatment of Mina is that she clearly holds Tandy in high regard. They got along well when working together and Mina offers her a job working alongside her. It may be working for Roxxon but it would be a good job working with a morally upright person so it has more perks than drawbacks. Tandy is so lost in her own despair that she doesn’t appreciate it and pretty much tells Mina that she deserves to have her hope taken away from her because if Tandy suffers then the world has to suffer along with her. Absorbing other people’s hopes is definitely a drug for Tandy that supplements the more traditional drugs that she also happens to be taking. It’s a really bleak and damning exploration of someone who has such a profound dependency that chasing the high is becoming harder. The pills don’t really work for her long term so she gets high on the hopes and dreams of others. That only works for so long so she craves more and descends further into her spiral of grief and self destructive behaviour. It all ties into the self worth theme that connects specifically to Tandy. It’s clear that she doesn’t think all that highly of herself so doesn’t concentrate on building meaningful connections to others or establishing herself as a meaningful presence in anyone else’s life. The reason the knowledge of her father’s treatment of her mother hits her so hard is because she has such a low opinion of herself that she sees herself in that way. If her father is like that then she must also be like that but she fails to understand that she can work to be a better person, fight that nature if it happens to be within her and forge her own path through life. She can’t accept Mina’s offer because she doesn’t feel like she deserves it and she looks to sabotage every good thing that she does have because of that self defeating attitude that is only amplified by recent knowledge. The return of Liam is also very telling in terms of what Tandy wants from life and how she goes about getting it. Liam has been allowed to rot in prison because Tandy couldn’t afford to bail him out. She tells him this because he’s familiar and wants to hear it. Tandy needs someone to be on her side for a while and for the moment that person is Liam. She opens up to him about living in the church because she pictured getting married there and wants to build a better life with him after so many years of heartbreak. This results in a marriage vision that is vague about who actually wants that for them in particular though I suspect that Liam is more invested in her than she is in him purely because Tandy had all but forgotten him in exchange for other priorities before this point. The perfect moment is stopped by the building around them crumbling and Tyrone showing up at that point which may indicate that subconsciously they both realise that the true path to happiness lies in them being together. Either way, Liam appears to be mistreated by this whole thing. Tandy is very hot and cold with him early on in the season and this pays off in a big way here when he suffers one rejection too many. He takes the hush money she recently acquired and leaves her to whatever self destructive impulse she will indulge next. This makes perfect sense given the setup because Tandy is clearly using him to feel needed by another human being even though she doesn’t feel the same about him. It’s a connection that was always doomed to fail and Liam taking the money is arguably what he is owed considering her went to prison for her while losing everything he had. 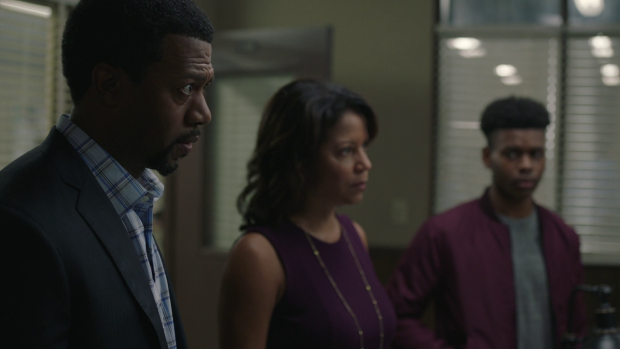 Tyrone has his own reality check when he learns that Connors hasn’t actually been brought to justice. His confession means that the investigation is reopened but it’s really far away from an actual conviction. Tyrone is really naive in this episode when it comes to how the world actually works. Last week he thought that closure had been achieved, his brother’s murderer was brought to justice and his parents would now finally see that he was right all these years. His assumptions were completely wrong on all counts and he seems to be further away from closure than he ever was. Reopening old wounds is definitely the major theme for the Johnson family this week and the exploration of this is excellent. Like Tandy Tyrone spirals out of control in his own way through lashing out at others. He starts by yelling at his parents who refuse to take his point. Their calm demeanour is something that makes him really hostile as he wants them to be as aggrieved about this injustice as he is though their reaction is more tempered because they know that this isn’t as monumental a breakthrough as Tyrone thinks it is. This comes out when he talks to his mother about it and receives a really harsh lesson in how the world actually works. Adina points out that a white cop confessing to kill a black man on tape means nothing. Tyrone is full of idealistic platitudes about seeing the world as it’s supposed to be but Adina urges him to live in the world that he actually lives in. Understanding that will help him live a longer safer life as she has seen what happens to those who try to stand up against the corruption. This discussion is rich and fascinating because there are two reasonable positions being expressed here. Adina comes from the perspective of having lived in the real world for a long time and dealing with those hardships. There’s a real sense that she has worked really hard to gain the influence that she does have but also understands and has been forced to accept that true equality is beyond her reach. Her approach to dealing with Tyrone is also an interesting one as she has abandoned the idea of justice for Billy’s death because she chose to keep her head down and focus on the son that is still alive. Once again it seems harsh but it’s completely understandable and makes a really strong point about racial inequality in the modern world. Adina is very grateful for what she has and doesn’t take that for granted. Tyrone is driven by revenge and wants justice for his brother. He sees the world as he wants to see it rather than it actually is which limits him in a lot of ways but also makes him a potential driving force in changing that. He certainly hasn’t given up the way his mother has though he will have to gain an understanding of what life is actually like before he learns how to navigate it. The fact that he is so easily framed for Officer Fuchs’ death and is hunted by the police at the end of the episode is as clear an example as you can get for what Adina has been saying. The realisation that everything hasn’t worked out perfectly affects him at school when he gets into a violent fist fight with a fellow student and finds himself on the brink of expulsion. Father Delgado takes it upon himself to act as a mentor to Tyrone and try to get to the root of his problems and understand where his anger comes from rather than letting it consume him. This is pretty much the opposite of what Tandy advises him to do which is in line with her attitude of not expecting anything good to come her way. Their conversation is really interesting because it highlights how differently they approach this period of regression. Tandy lashes out at him calling him childish, putting herself down and refusing to accept his emotional support. She wants Tyrone to come down to her level as justification for this being the right way to act. If she can convince Tyrone that she’s a terrible person then she doesn’t have to try to be anything better which she feels is the most comforting way to cope with everything she is dealing with. Eventually she does decide that speaking to her mother is the right thing to do though it’s unclear if this will actually help. Is this Liam or Tandy’s fantasy? Tyrone may be angry but he’s a lot calmer than she is because he has a healthy support system through his parents, Evita and Father Delgado. He is better able to cope because those around him have his best interests at heart and can’t be escaped. Tandy has nobody in her life by choice and wants to convince Tyrone that she’s right to do this. When she pulls the light dagger on him he doesn’t even flinch because he knows that she would never hurt him and makes it clear that he won’t give up on her. This conversation is what opens Tyrone up to seeing the world differently while still being open to the possibility that he can make it a better place which once shows how profound the connection between them is. The key difference is that Tyrone embraces it where Tandy rejects it. Father Delgado’s advice about being a better person and learning from mistakes has a lot more weight to it when Tyrone sees his fears. It appears that Delgado reached a turning point in his life when his alcoholism resulted in the death of a young woman in a car accident. It’s a striking image that seems to define Delgado and acts as a wake up call for Tyrone who realises how easy it is for his own life to spiral out of control unless he takes responsibility for it. Delgado is a really good mentor figure because his lessons have meaning and are shown to be applied practically to Tyrone’s life. Evita is still an interesting character though the Voodoo side of things is somewhat hit and miss. Her realisation that Tandy is the other half of the Divine Pairing comes as a shock especially when she manages to stop Tandy absorbing her hopes. Where this falls down is with her aunt Shantelle who is frustratingly vague about why she knows things or where her feelings are leading to. It’s such a minor thing in the grand scheme of the overall plot but it doesn’t blend in as well as it should. I did like seeing the role reversal when Evita was worried sick about her aunt being out all night showing how responsible and sensible she is while making it clear that her aunt is clearly not herself. O’Reilly is dealing with the open wound of Officer Fuchs’ death. Her coping mechanisms involve drinking and falling back on her training when she assessed the crime scene to follow blood trails and find the murder weapon. 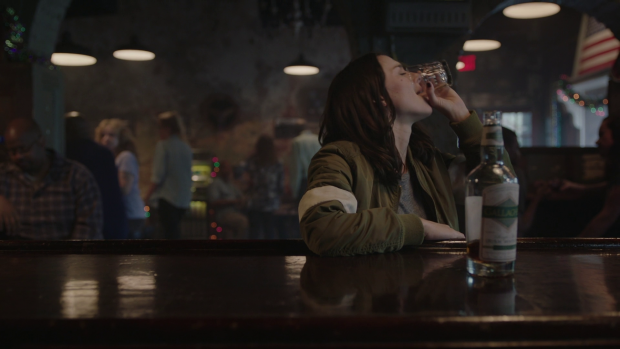 Later on she sees Connors drinking in the same bar she happens to be in acting as if nothing happened which results in her trying to attack him and being brutally beaten for her trouble. The most striking thing about this plot is that O’Reilly doesn’t have a single line in the entire episode yet her feelings are perfectly conveyed through excellent use of visual storytelling combined with Emma Lahana’s wonderful performance. Her reaction to what she has lost is conveyed better through her actions than any dialogue could. An excellent episode that forces the characters to fall back on old habits while still acknowledging that they have changed. Tandy’s self destructive nature has evolved to the point that she now uses her powers to chase her next high. In this case she steals the hopes of other people which is shown perfectly through Mina’s dreams of natural beauty being replaced by decay which causes her to kill a bee. Tandy once again believes that she doesn’t deserve anything good in her life and lashes out at everyone possible to confirm that belief. In particular she uses Liam for validation who decides that he’s had enough and leaves her before setting her sights on Tyrone who doesn’t rise to her attempt to force him to accept her way of thinking. Ultimately she decides to confront her mother but there are a lot of issues there. Tyrone’s biggest obstacle is his naivety about how the world really works. Connors hasn’t been brought to justice and closure hasn’t been achieved so he feels lost. It takes his mother and Father Delgado to give him tough yet clear lessons on how the world works and Tyrone is able to consider his own spin on that lessons in an attempt to make the world a better place as much as he can. As with Tandy he has a long way to go but his support system means that he’s better equipped to deal with things more healthily than she is. Evita identifying Tandy as the other half of the Divine Pair is interesting though the Voodoo aspect of the show is still a little too abstract for my liking and doesn’t seem to blend with the rest of the setup at this point. O’Reilly’s role in the episode was excellent as it perfectly conveys her emotional state without her saying a single world through powerful acting and strong visual storytelling.